MIT scientists say they have developed a synthetic delivery system that is four times more effective than delivering messenger RNA (mRNA) on its own. The method can potentially be used for administering vaccines or treating cancer. “If we want to be able to deliver mRNA, then we need a mechanism to be more effective at it because everything that's been used so far gives you a very small fraction of what would be the optimal efficiency,” says Paula Hammond, Ph.D., a David H. Koch Professor in Engineering, the head of MIT's department of chemical Engineering, and a member of MIT's Koch Institute for Integrative Cancer Research. Dr. Hammond is the senior author of a paper (“Polyamine-Mediated Stoichiometric Assembly of Ribonucleoproteins for Enhanced mRNA Delivery”) that appears in Angewandte Chemie. “Inspired by the dependence of mRNA on 3′-terminal polyadenosine nucleotides (poly A) and poly A binding proteins (PABPs) for optimal expression, we complexed synthetic mRNA containing a poly A tail with PABPs in a stoichiometric manner and stabilized the ribonucleoproteins (RNPs) with a family of polypeptides bearing different arrangements of cationic side groups,” write the investigators. mRNA is appealing as a potential vehicle to treat disease or deliver vaccines because after an mRNA strand is translated into the desired protein, it eventually degrades. But mRNA first has to get into cells and, once there, it needs to reach the ribosomes to be translated into protein. In a previous study, the MIT team showed it could improve the rate of mRNA translation by attaching a protein cap to one end of the mRNA strand. 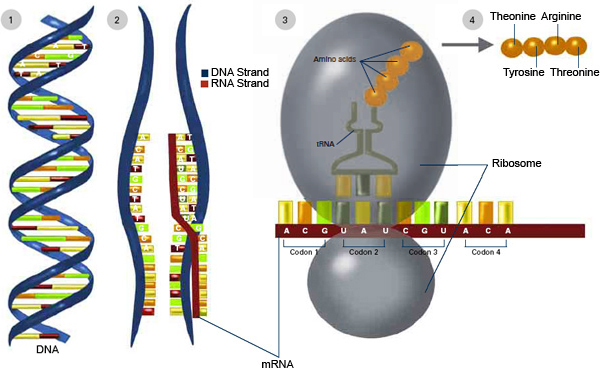 This cap helps mRNA to form a complex that is needed to initiate translation. In the new study, the researchers focused on the other end of the mRNA molecule. Naturally occurring mRNA usually has a long “poly(A) tail,” made up of adenosine repeats, that stabilizes the molecule and helps it to resist being broken down by cellular enzymes. The team attached PABP to this tail because it helps mRNA to bind to ribosomes and begin the translation process. The researchers then coated this complex with a polypeptide that acts as a scaffold to hold the PABP and mRNA in close contact. It also helps to neutralize the negatively charged mRNA. Without that neutralization, mRNA would not be able to pass through cell membranes, which are also negatively charged. Once the polymer-coated mRNA enters a cell, the PABP protects it from being broken down and helps it to link up with ribosomes. The mRNA forms a closed loop so that a ribosome can cycle through it many times, producing numerous target protein copies. In this way, the effect of mRNA, which is a costly genetic therapeutic, can be significantly enhanced by combination with much cheaper synthetic polypeptides and proteins, according to Jiahe Li, Ph.D., a postdoc. The system was tested by delivering mRNA that encodes the luciferase gene into the lungs of mice. The result was that cells produced four times as much protein as they did when only mRNA was packaged with the same polypeptide for delivery. The team thinks its approach is particularly efficient because it eliminates the need for mRNA to find PABPs in the cytoplasm environment after the mRNA enters the cell. In this study, continues He, the mRNA particles accumulated in the lungs because of the polypeptide's positive charge, which allowed the particles to attach to red blood cells and catch a ride to the lungs. However, the researchers now plan to explore modifying the particles with polymers that will direct them to other locations in the body, including tumors.